Bhakti Brhat Bhagavata Swami's Arrives in Toronto Tonight - 8:30pm! ~ The Toronto Hare Krishna Temple! Bhakti Brhat Bhagavata Swami's Arrives in Toronto Tonight - 8:30pm! Bhakti Brhat Bhagavata Swami (formerly known as Brhat Mrdanga das) who has been a spiritual guide, friend and teacher for many devotees at ISKCON Toronto accepted the order of sannayasa or renounced order of life recently. 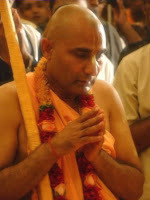 Today, May 4, Bhakti Brhat Bhagavata Swami comes back to Toronto for the first time since his acceptance of the monastic order of life. He has been an inspiration for devotees in Canada for over a decade and we want to make his first visit as a sannayasa to Toronto extremely special! He arrives today at 8:30pm and an open call goes out to all devotees to come to the temple this evening as we certainly want to greet him in a special way with kirtan, flowers and much more! Please join us in welcoming Bhakti Brhat Bhagavata Swami tonight!